Please note that the content of this book primarily consists of articles available from Wikipedia or other free sources online. 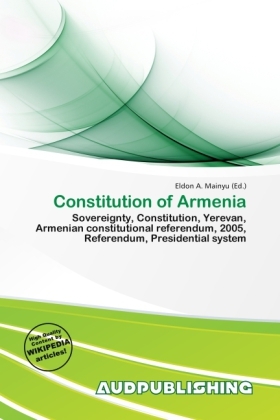 The Constitution of Armenia was adopted by a nationwide referendum on July 5, 1995. This constitution established Armenia as a democratic, sovereign, social, and constitutional state. Yerevan is defined as the state's capital. Power is vested in its citizens, who exercise it directly through the election of government representatives. Decisions related to changes in constitutional status or to an alteration of borders are subject to a vote of the citizens of Armenia exercised in a referendum. There are 117 articles in the 1995 constitution.